One of my best memories growing up is staying at my aunt and cousins house every weekend with my mother. We would wake up every Saturday and they would drop me and my cousin off at Putt Golf and Games. They had a deal where you paid $5.00 and would get 100 tokens to play in the arcade. This was back in the early to mid 90’s when the American arcades were in full swing and always full of people. This was where I was turned onto Arcade gaming, and why I am still to this day keeping up with what arcade games are being released overseas. The first time I ever played Street Fighter, Final Fight, and Neo Geo was in the arcades. Those memories are also why I bought my own Neo Geo arcade cabinet and own a small collection of arcade JAMMA boards. So when the big boss KJ asked me to review Punisher on any console I choose, there was no thinking involved. The arcade version was the only option! Sadly enough I missed Punisher growing up, however, one of my close friends owned Punisher about a year ago and we played it on his candy cabinet. I am happy I got the chance to finally enjoy this game, write about it now, and share my thoughts with everyone out there curious if this title is worth your quarters. The Punisher was released in the arcades on Capcom’s CPS1 hardware. CPS1 stands for Capcom Play System and many titles were developed using this hardware including Street Fighter, Willow, and numerous other titles. CPS1 is a JAMMA board which means it will play in almost any arcade cabinet ever made past the early 90’s. The Punisher is a side scroll beat em up game very similar to Final Fight. You control a character, in this case The Punisher, or classic Nick Fury complete with stogie, and traverse the city streets kicking and blasting thugs until your heart’s content. The game controls very simple. There are only 2 buttons, jump and attack. With those 2 buttons though you can do a lot. You have a few different combos, and throws, and you can even roll which is a very nice addition. You also have specials by pressing 2 buttons at once, jump kicks, sliding kicks, and a plethora of weapons you can grab and use. Most notable are guns which have a cool little comic book BLAM! text effect when fired. The controls are easy to learn with only a few problems. The first being to throw a grenade you have to jump and press jump and attack at the same time, and the second I am not sure if is technically a problem. It seem like you can only draw and fire your gun when other enemies have guns. Which was annoying. But I could have done it wrong. Other than those two little complaints everything seems pretty solid. Punisher looks really good. The sprites are large and animated when standing still. You can see Punisher breathing, and Nick Fury’s cigar smoke. The boss characters also have their own animations which make them feel more alive. The breakable objects in-game also look good and about the same as in Final Fight. For the most part the animation seems pretty fluid and I can’t really complain. The backgrounds and landscape in the game I feel just look ok. I’m a big fan of detail in backgrounds and Punisher doesn’t have a ton of detail in the backgrounds. The issue I have with the landscapes is that they just didn’t have a Punisher feel to me. I would have preferred something a little more gritty and dark like night-time city streets, not trains and forests. Furthermore I feel like most of the stages were just taken right out of final fight. They look very similar. That doesn’t make the game bad, it just isn’t very creative. The music in Punisher is ok. There are a few catchy tunes like in the boss fights. It’s just very fast paced electronic synth type stuff. The sound effects are a bit better than the music. You can hear the enemies grunt as they die, and the guns firing, and the objects in-game as they are destroyed. But again a lot of this just sounds like it came out of Final Fight. The Punisher controls well. The action is fast and never-ending. Unlike most other Capcom beat em ups there is a bit more story here. You get a little piece of story after every stage with good-looking cutscenes. Also I really like there are more moves and weapons that are actually useful. In Final Fight a weapon was a death sentence. So useful weapons are a good addition. Seeing as how this is an arcade game there isn’t a ton of replay. This is the type of game you may play a few times in a year because it’s fast and fun. The best way to get your replay out of arcade games is to limit yourself in the number of credits you play. I never beat an arcade game unless I can do it on 4 quarters. That way you don’t beat the game and never play it again. After that I like to 1 Credit Complete the game (1CC) as you will see it on YouTube or online. Also it is always good when mastering these games to turn up the difficulty. That’s really the only way to get the most play out of these games. Limit your credits, and refrain from just beating them by powering through them with credits. You will enjoy them much more. When reviewing beat em up games it is really hard to compare them to Final Fight. If you go and compare every beat em up to Final Fight you are going to be disappointed MOST of the time. 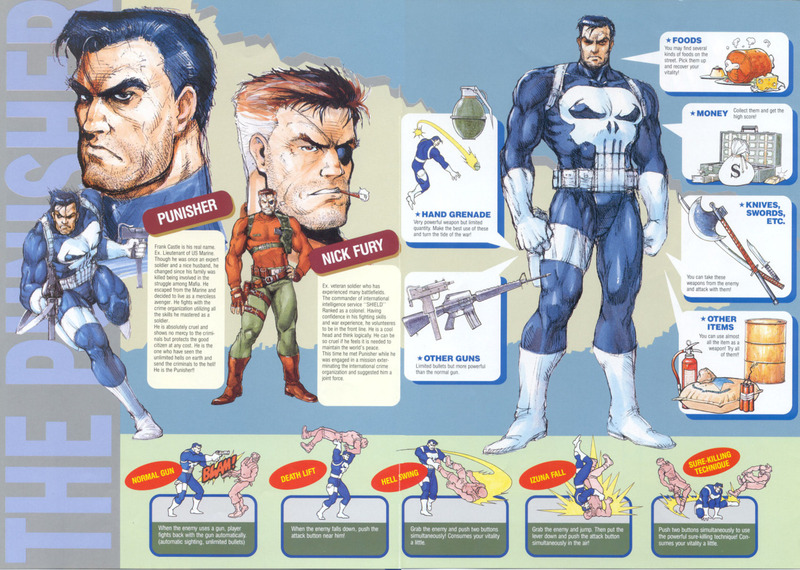 However there are titles that can hold their own with Final Fight and I really think Punisher is one of them. It’s fast and full of action. It capitalized on a lot of Final Fights mistakes, namely having more moves, and better weapons with the addition of guns and blood!. Although I feel like a lot of the game was ripped directly from Final Fight, I guess if you’re going to recycle gameplay and sprites Final Fight is a good choice. Even though the music and backgrounds are not the greatest I still feel the game is pretty solid and worth anyones time. The only real problem I have with this game is it wasn’t dark enough, and that the characters with exception to the boss characters didn’t really fit in the game. There should have been better enemies in the game that tied in with the comics. When I fight ninjas and robots I don’t think Punisher. If the backgrounds had been better, the enemies changed, and just a bit better music this game would have had a near perfect score.